Business Attitude: Localization - It's about Much More Than Printing. Localization - It's about Much More Than Printing. Let's make this country a better place and there is no better place to start than in our own hometowns. As anyone who follows this blog or knows the Time4 and LightsOn initiative; it is quite simple: Make Our Customer Succeed. We are all about recreating local in a world that knows more about a Jersey Shore celebrity than their own neighbor. Lets fix this by starting in our own home town. The following three past articles give some background to this idea. Collaborative Marketing Efforts Make The Impossible - Probable. Followup on "Who Me, Who Three - Fixing the Local Print Business" Can the Local Printer Survive? Over the last couple months we have been testing our "Buy. Eat. Live. Local." concept with the purpose of moving "Buy Local" from a lip service to a way of life - our lives and our future. We have made the objective of "Buy. Eat. Live. Local." a product (evolving as it is) to help communities across the country by providing it to local entrepreneurs who, most importantly, live there, work there and buy there. Have you ever been there? "Buy. Eat. Live. Local." is the coming together of many environmental, business, social and economic factors. One of the biggest factors is the forth coming re-urbanization of America over the next 20-30 years which I will be writing about extensively. For those as old as I, think about it as Megatrends 2013. How well grasped is this concept? 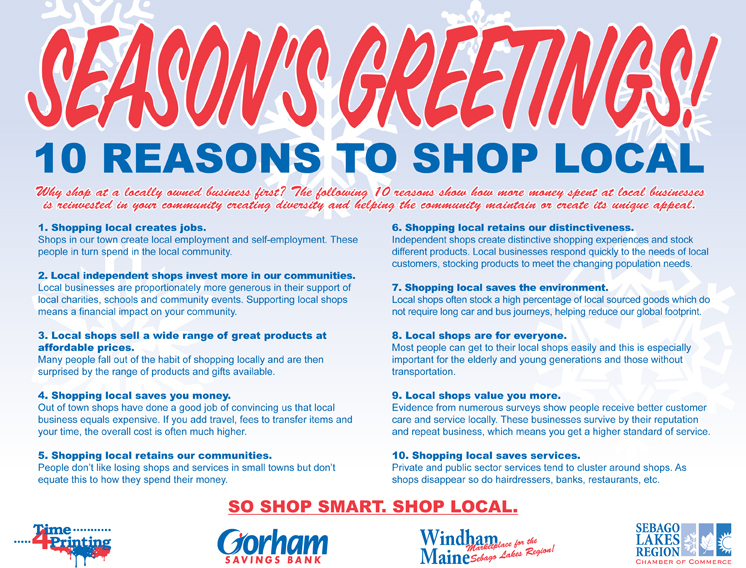 Here is the Town of Windham Maine's ad - a paid ad - giving 10 reasons why this just makes sense. 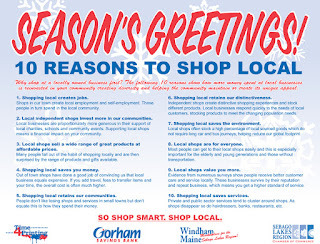 So Shop Smart and Shop Local. ”Natural Communities Form Around Community and Commerce Centers”. Better Service at a Better Price with Less Hassle. Why? You know them – They depend on Windham people and they live in Windham. Buy. Eat. Live. Local and watch Windham grow. This is not a concept coming to your home town, it's already there !! !